The Cottage Grove Bridge, built during the I-235 corridor reconstruction, provides a vital link across the interstate for motorists as well as bicyclists and pedestrians. It carries both northbound and southbound traffic in an area comprised of residential and commercial properties. This bridge replaced two substandard bridges that did not accommodate projected traffic demands or clearance requirements. The 34-degree skew alignment of Cottage Grove extending across I-235 results in the longest span lengths of the I-235 corridor. Because the span lengths exceed the available prestressed concrete beam lengths, custom-designed steel plate girders were needed. Span lengths and the generous bridge width resulted in heavy loads on the new delta pier, requiring innovative reinforcing solutions. Roadway profiles of both Cottage Grove and I-235 were adjusted to meet current vertical clearance requirements. The extreme span lengths, as well as structure depth restrictions, impacted the girder design. Extensive analysis revealed the most economical and practical girder plate sizes. The long spans and high 34-degree skew dictated the use of expansion joints at abutments. Unique expansion device details were developed during design, with consideration given to the aesthetic maskwalls, traffic barriers, and vehicle safety. 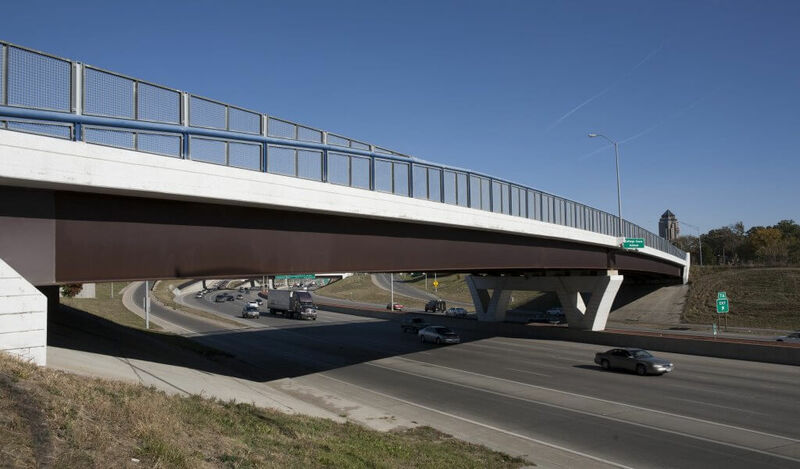 The careful design and detailing of this impressive structure enhances the appearance of the I-235 corridor and improves local traffic movement and safety.